Step into a stunning wilderness unlike anything else. As you travel you’ll discover different ecotopes, tribal settlements and Machine types, as well as the towering ruins of a forgotten era. Can you unlock the mysteries that link them together and discover the fate that befell mankind? 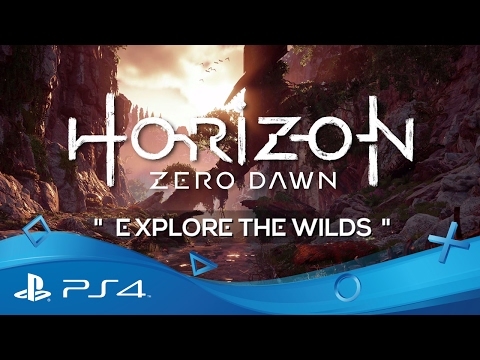 From the frozen mountain ranges of the north, to the hot, dense jungles of the south, the world of Horizon Zero Dawn offers a wide variety of different geographies. Traces of a lost civilization linger throughout – discover overgrown ruins and buried secrets that have lain undisturbed for generations. Along your journey you’ll meet several different tribes, each with their own culture and traditions. The Nora are an isolationist, matriarchal tribe of fierce hunters who worship their nature goddess, All-Mother. They are forbidden to leave her Sacred Land, or explore the ancient ruins of the Metal World, without risking exile. They view the other tribes as heathens at worst, interlopers at best. The other tribes see the Nora as mysterious barbarians, though many colourful rumours and legends circulate about the tribe. The sun-worshipping Carja consider themselves the most civilized of the tribes, ruling a great empire from their City of the Sun, Meridian. Under the tyrannical rule of the previous Sun-King Jiran, they waged war against the other tribes for sacrificial slaves until a coup by the king’s progressive son, Avad. The other tribes, having hated and feared the Carja, are now warily re-establishing contact – though most still consider them stuffy and pompous. After a coup against their previous Sun-King Jiran, the Carja tribe descended into a civil cold war. Jiran’s surviving hardliners declared themselves the Shadow Carja and claimed a fortress citadel in the west, Sunfall. The Shadow Carja fanatics are universally despised. The Oseram are a secular, hardy tribe of metalworkers, explorers and tinkerers – inventors of unusual devices or powerful weapons. It was an Oseram-Carja alliance that allowed Sun-King Avad to overthrow his father’s regime, and now the two tribes are strange neighbours in the streets of Meridian. The other tribes respect Oseram steel, but their brash, forward behaviour is often taken as boorishness – particularly by their new allies. The aloof Banuk seldom descend from the snowfields of their homeland, but are renowned for the Machine-hunting skills of their warriors and the strange mysticism of their shamans. A tribe of survivalists, they prioritise proving themselves against the odds, instead of engaging with other tribes or their politics. Due to this frostiness, the other tribes view them much as they do the Nora: curious but largely unknowable savages from the east. Bandits survive by raiding the villages and caravans of other tribes. Occasionally they will claim abandoned habitats entirely, turning them into staging grounds for new raids. They take great pleasure in repurposing loot for their own twisted designs. Opportunistic and hostile, Bandits live in a near-constant state of chaos. This is also their primary weakness when facing tribes that are better organized.